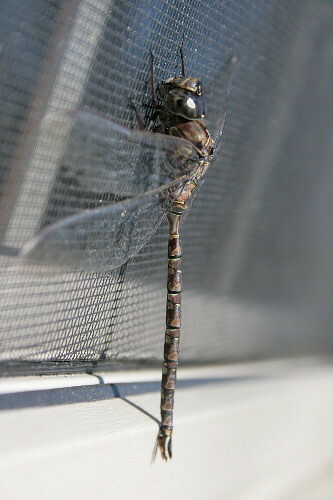 A few days ago Dan pointed out a dragonfly that was sunning itself on the screening of the window at the front of the house. Or at least, it looked like it was sunning, on the south-facing side with its wings spread. Dragonflies (and all insects) being exothermic, most of their body temperature control is achieved through exposure (or not) to the sun (some insects will shiver, too – you may see this in moths, for instance, on cooler nights). It didn’t move, though, and I began to think maybe it was dead, the barbed feet still clinging to its final resting place. It did look a bit ratty, with a few nicks out of the delicate wings. It didn’t leave as I approached, or even as I reached out to grasp it. But as I gently folded the wings together over its back there was stiffness, resistance, that wouldn’t be there if the insect was dead. Holding the wings firmly, I lightly pulled on it to see if it would hold on to the screen; it did, and the legs moved feebly once detached. So it was still alive, just sluggish from the cool night. I took a few photos but left it where it was. Half an hour later, presumably sufficiently warmed, it had left. 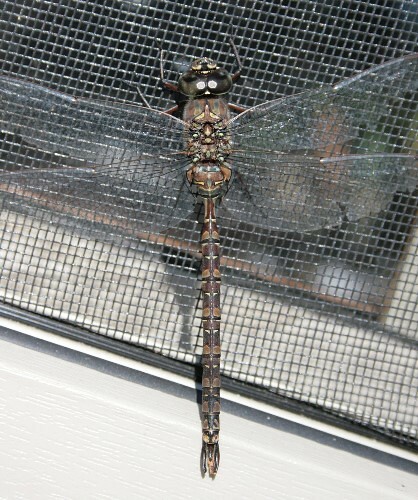 The large size of this dragonfly makes it a darner, and the dark body with two diagonal stripes on the thorax makes it a mosaic darner, one of the species in the genus Aeshna. 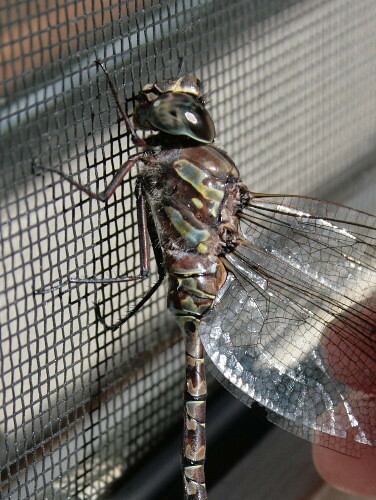 There are more than a dozen mosaic darner species in our area, and they all look confusingly similar. Identification is usually best made with the critter up close or in the hand, but they rarely settle down for long and are frustratingly difficult to catch with a net, while in flight or otherwise. The vast majority of my identifications of this group have been made in situations such as this – sluggish individuals that are easy to get a photo of. The ID for these guys depends primarily on two characteristics: the shape and colour of the thoracic stripes, and the same of the markings on the abdomen (particularly the segments closest to the body). The eyes can also be useful for species identification. Having the dragonfly in-hand, or having a photo of it, while you ponder the possibilities is really invaluable because it offers you the opportunity to check for small details. In the case of this one, it has a very distinctive marking that no other species have: that little dot just on the inside of the front thoracic stripe. Also, the sharp hook on the front of the stripe itself. Both of these features identify it fairly easily as a Canada Darner, Aeshna canadensis. The majority of the mosaic darners are not nearly so easily identified, bearing more generic straight slines of varying widths. I have two dragonfly guides: Stokes’ Beginner’s Guide to Dragonflies and Dragonflies Through Binoculars. I like the photos better in the first, but the species coverage and information are better in the second. There are a few other regional guides in print, some of which are very good, that I simply haven’t gotten around to picking up. At this point, though, I’m waiting for the new Peterson Field Guide to North American Dragonflies by Ed Lam. I’m not certain when it comes out, but Ed was contracted in 2006 with a four-year submission target (I think), which would make it within the next year or so. Ed is painting every single species. Males and females and colour morphs. I can’t even imagine the amount of patience such a task would require! But the guide looks to be beautiful and extremely usable once it’s done. You can check out samples of the illustrations at his website. Canada Darners are late fliers. They first start to emerge in July, but they can be found on the wing through October, till we get into sustained periods of cold. Some species of darners are migrants, moving south in the fall to warmer regions. Those great swarms of darners you might sometimes encounter during the late summer and autumn might be migrant swarms, feeding before they push on (darners will also simply swarm where there’s really good eats to be had, though, and it can be hard to determine which type a particular swarm is). However, Canada Darners, as far as I know, are not one of the migrating species. Interestingly, Dragonflies Through Binoculars notes that “this species darkens when cool”. I gather this isn’t the case with all species of mosaics, and would explain why this individual looked so muddy to me. Those thoracic stripes are usually sky blue and yellow-green. The abdominal markings are generally all blue. You can just see the colours starting to come out in the thoracic stripes – if that is indeed what’s happening here – though the abdominal markings remain brownish. Aside from this guy, the only other dragonflies I’ve seen around in a couple of weeks have been meadowhawks, which seem to be the latest fliers around here, at least in any numbers. Soon, even they’ll pack it in for the year. It’s nice to enjoy these lingering traces of summer while they last. Another great article! I had no idea dragonflies could change colours, that’s an interesting behaviour to study! Wow, those Lam illustrations are fabulous. Just doing the wings would be crazy-making. The Cleveland Museum of Natural History has a second edition of Dragonflies and Damselflies of Northeast Ohio, by Larry Rosche, Judy Semroc, and Linda Gilbert. It is excellent, with hundreds of identifying photographs. Great post. I have had the two guides you mention for some years and they are fine – Stokes’ is good for learning families and ‘Binoculars’ has excellent written accounts. More recently I acquired (Jones et al) ‘A Field Guide to The Dragonflies and Damselflies of Algonquin Provincial Park and the Surrounding Area’ – great illustrations (many for each species), up-to-date taxonomy and surprisingly comprehensive for the fauna of Ontario. It’s the first in a series of guides sponsored by the Friends of Algonquin Park. I understand a guide to sedges in the works. Fascinating. If anyone had told me that someday a naturalist’s account of dragonflies would give me a flashback to my first encounter with a Mood Ring, I’d have thought they were nuts.